From offering water savers door-to-door, today they are bosses at Tescoma, a company with a billion crown annual turnover and highly visible logos at shops all around the nation. IN THE BEGINNING of the 1990s, musician and auto mechanic Petr Chmela, along with many others, tried to strike out in business. After some unsuccessful attempts, he began selling water savers door-to-door, which proved to be a relatively lucrative business. “I could have sold more than I had the money to purchase the products for,” Chmela recalls. So when he met fellow musician Jiří Vaculík, who was working as a warehouseman in Vienna, he offered partnership in exchange for his input of some capital. They reached an agreement, and the firm was successfully established. They began buying water savers in quantity directly from the importer and hiring more salesmen for distribution throughout the Czech Republic and Slovakia. They put the money they made back into the firm – Chmela stresses that they still do it to this day, which is the basis for their success – and they gradually added other goods and commodities: thermos bottles, auto accessories, electrical appliances, etc. In 1994 the company sold CZK 239 million worth of goods and used its own brand, Tescoma, for the first time. But that also brought up the question of what to do next. “We didn’t see our firm’s prospects for the long term,” Chmela says. They kept their eyes open when traveling abroad, looking for inspiration. “We noticed there was great interest in kitchen products, so we decided to place our focus there,” Chmela says. 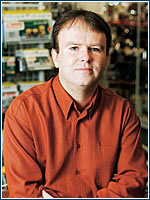 By 1996 the firm had gradually specialized on kitchen wares. In the beginning they bought products from other factories around the world, selling them under their own brand. “In this country, this industry has no tradition, so we had to look for manufacturers internationally. Today we work with over 100 of them, from Europe to Asia,” Chmela explains. However, in the meantime they started building their own design studio, and in the last two years customers have been able to choose from products that are completely designed and produced by the Tescoma firm. 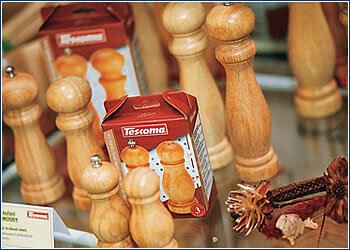 Tescoma currently makes about 1,000 various types of items for the kitchen. The basis, the largest part of the assortment, is made up of stainless steel products, mainly pots and pans, knives, and cooking utensils, as well as plastic and wooden goods. Tescoma has about 1,000 sales outlets in the Czech Republic and Slovakia. The products are distributed mainly through hypermarkets and large retail chains. In 1993 the company opened its first foreign branch, in Slovakia, and three years later another two, in Poland and in Italy. Today, almost 40% of the company’s production is exported, with Tescoma goods sold not only in central and eastern European countries, but also in Spain, France, and Tunisia. Since Tescoma produces and sells in many locations around the world, logistics is critical. The firm organizes an entire retail chain (from production to retail sales, without wholesellers) and it uses no importers or distributors, which allows it to control its costs directly. Besides its Zlín headquarters, the firm has a storage and administrative center nine kilometers from Prague, right next to a highway, which allows great connections with the world. A month ago Tescoma also opened a new logistics center in an industrial zone on the east side of Zlín. The center required an investment of CZK 350 million, it has state-of-the-art equipment, and room for up to 20,000 pallets. Storage and distribution are controlled by an SAP information system that Tescoma began using last year and that completely covers the company’s needs, from accounting to marketing. The firm places great emphasis on product quality. “We have our own employees around the world to check on the manufacturing process,” Chmela stresses. “Every product has its own card on which all of the information on it is recorded. 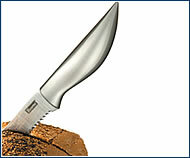 Random checks are also made in the warehouse.” Guarantees range from one to five years according to the type of product. According to Chmela, the firm does not keep statistics on complaints, because it is able to meet its goal, which is less than one percent of total products sold. Considering that in 2001 Tescoma sold more than 7 million products, this is a remarkable achievement. But when there are justified complaints about products, the company policy is for the customer to get a new product within one week, even though the law requires that manufacturers resolve complaints within one month. “We exchange defective goods for new, one for one, no repairs,” claims Chmela, proudly displaying a folder filled with letters of thanks from satisfied customers. Provided the firm doesn’t slack off with services such as these, it may be able to meet its goal: to become number one in the world in its field in three to five years. Advertising – ready, aim!You will find the Tescoma logo nearly everywhere. 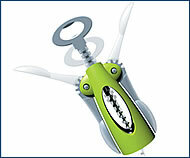 The company does all it can to increase its visibility, and more than attractive packaging is involved. Besides constant print ads in women’s magazines like Vlasta, Tescoma also uses a lot of television advertising. 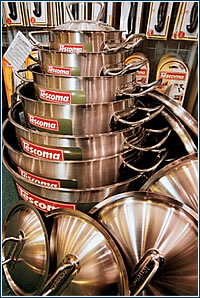 The first TV campaign for Tescoma products was aired back in 1994, shortly after the name was born. The advertising was built on the personality of the actress Helena Růžičková, and it included a TV spot, shop window displays, and decals. The second campaign, focused on increasing brand awareness, was prepared by Ogilvy & Mather. The advertisement was directed by Jan Hřebejk and introduced the firm’s motto, “Tescoma has what it takes!” and ran twice daily for a month on ČT, Nova, and Prima. Petr Chmela, one of the owners, was even able to squeeze the ad’s name into the list of programs in the TV schedule. For the last two years Tescoma has been working with TV Prima. As the general partner of the program “Prima Cooking Spoon”, Tescoma delivers its products and is taking part in the preparation of a cookbook, the second part of which is nearing completion. This year the firm took a remarkable advertising step – it became a general partner of the soccer team FC Tescoma Zlín. “We want to try something new in advertising. Soccer is popular, and the target group is different,” Chmela says, adding an explanation: “true, women make small purchases, but when it comes to more expensive acquisitions, the family decides.” Each year Tescoma spends about 3% of its billion in sales on advertising. For the last two years Tescoma has been selling products designed by its own six-member team of designer and graphic artists under the leadership of Petr Stibora. The firm didn’t hesitate to spend a great deal of money on a unique piece of equipment which, once the parameters have been entered, creates a plastic prototype, so that the designers can then test its properties and try to find ways to improve it. Nothing is left to chance, and the refined prototypes are tested in households to allow for the elimination of any defects. The design work sometimes takes over a year, and it also includes the creation of packaging. “It’s meticulous work, but it succeeds in the long run,” Petr Chmela insists, while tossing product samples with resourceful, colorful packaging on the table.